I'm sorry this had to be a short reminder, but I hope you can help the Shiloh Singers celebrate 2016 and the rebirth that the new year brings on Sunday afternoon, December 11th, from 1:30 to 4:00 P.M. in the General Store at the Shiloh Museum of Ozark History in Springdale. Any early arrivals are welcome to join the Singer's table at Springdale's AQ Chicken House around noon. Visitors are always welcome to join us. Like most folks, this is a busy season with special church and school programs, trips to visit friends and relatives, end-of-the-year closeouts and celebrations. And the Shiloh Singers really do have so many things to celebrate. Shiloh Singers traveled to singings in Arkansas, Missouri, Oklahoma, Texas and even Europe. We enjoyed meeting many singers during our travels and meeting new singers and visitors at our local singings. Many of us have made new friends along the way. Thanks are due the Shiloh Museum who continues to help us throughout the year. There are so many people and things worthy of thanksgiving and celebrating as we bring another year to a close. God's blessings are too many to list. I hope you all enjoyed the singings and fellowship that brings us together throughout the year. This is the Christmas singing so feel free to bring any extra Christmas cookies (that aren't on my diet) that you might have from early Christmas parties. We'll have coffee, water, and maybe a little cold apple juice and cider if you have a good source. Second, Singers drive in to Springdale from all directions and distances. I'll just ask that you check your local weather for driving conditions before you leave home. Springdale is predicted to be "warming with a chance of rain." But this is Arkansas. I'll still plan on bringing a little extra heat for the resident Shiloh cat and the alto section. We want to sing with all of you next year too. Drive safely. Unsurpassed Opportunities to Sing and Learn in October! BUT WAIT THERE'S MORE The Annual Fall Sacred Harp Singing School is scheduled for Friday evening, October 21, 2016 from 6:30 until 8:30 pm in the General Store at the Shiloh Museum of Ozark History, at 118 W. Johnson Avenue, Springdale, AR. This provides a good follow-up opportunity for brand new singers as well as advanced training for other singers who want to learn even more with a refresher course. I always learn something new from the experienced instructors. Hopefully, some of the new singers we met at the Murrell House singing will attend the singing school and learn more about Sacred Harp singing. As always, visitors and children welcomed. NEW INFO: Syd has also made arrangements for our usual tables at AQ Chicken House for those who would like to have supper and greet Rene Greene, who will be the instructor at the Friday evening singing school. The restaurant is located at 1207 N Thompson St (just a few blocks north of the W Huntsville Ave/Hwy 71 intersection) and it's only a few blocks away from the museum. While we'll start "about 5 o'clock, we know some will be traveling after work so don't worry if you arrive a little later. AQ has plenty of chicken. On Saturday, October 22, 2016, the Annual Fall Sacred Harp Singing Convention will conduct an all day singing with a pot-luck lunch. Starting at 9:30 am we'll have a traditional singing but with time to reinforce the lessons learned in an enjoyable setting among friends who share a common interest in shape note singing. In addition, the lunch is a chance for everyone to share their best dishes and desserts. The 3:00 pm ending time hopefully allows singers to get an early start on the trip home. 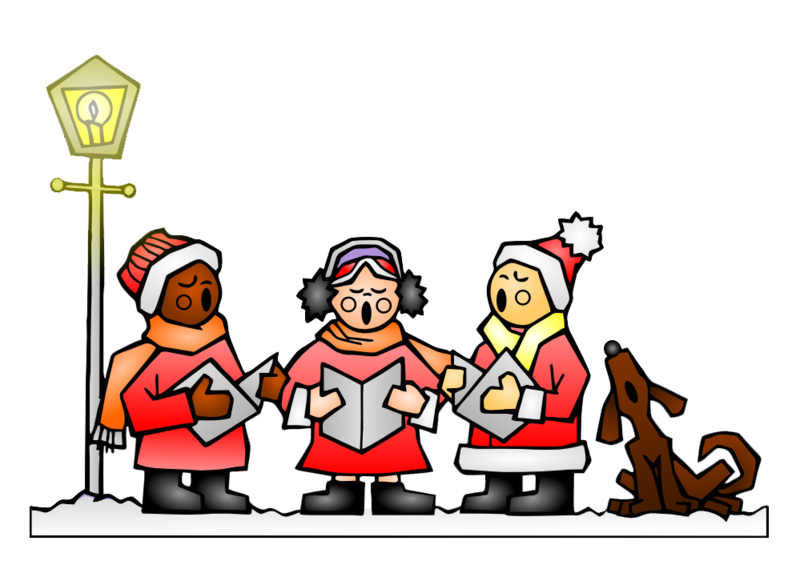 This year, thanks to Northwest Technical Institute, the singing will be held in the NWTI Student Center, on the SW corner of the campus at 709 S Old Missouri Rd, Springdale, AR. Plenty of parking is available and it should provide easy access for everyone. For those who may not be familiar with Springdale, we have prepared a PDF map and schedule. 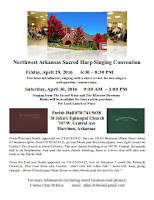 Click on either underlined link, download and print with directions from I-49 to the Shiloh Museum of Ozark History for the singing school on Friday evening and directions that extend to the NWTI campus on the east side of town across the street from the Springdale Airport for the Saturday Singing. Those traveling from points east of Springdale. turn north on Hwy 265 and look for Ford Ave. across from the airport. If you're wondering what to bring for the pot luck lunch, this is a chance to show off your favorite dish, casserole, baking, or dessert or if pressed for time, make a quick trip to the local deli. Somehow, it all seems to work out and and everyone finds more than enough to eat. We do have some good cooks among our singing group. Best of all, we have the opportunity for outreach to the community, a singing school and a regional singing convention for singers from all over the territory. We have an opportunity for growth. That's a tremendous opportunity for singers that's too good to miss. On behalf of all the singers, we hope to see you there. "Was a great day - thanks for all! ...It was an enjoyable day." Dan Brittain, Director of Music. "Very pleased with the number of singers who came today!" Secretary Katy Black, who sends the minutes from events to the national organization for printing each year. As best I could count, we had at least 35 people at the Murrell Home Festival who used a book. actually sat down around the square and either sang or followed along with us. We even had a couple of exchange students who visited yesterday with their sponsor. My thoughts while drinking my first cup of coffee on Monday morning were about how far so many singers came, with their families, with boxes of loaner books, and how so many casual visitors walked up just to listen and then sat down and picked up a book. I believe part of the success was that the event was not scheduled as a brief "performance." It was a real, sit-in-a-hollow-square with individuals leading in the middle, Sacred Harp singing. The singing followed an 1800's era pioneer chuch service under the trees and we sang in the open air under a canopy of green trees and blue sky. With all the picnic tables available, maybe we should think about dinner on the grounds someday if that can be included. Our thanks to our gracious hosts at the Murrell Home Historic Site, and the Oklahoma Historical Society for an unexpected honorarium that will help the Shiloh Singers purchase more loaner books. Our sincere thanks to the singers and visitors from Oklahoma, Missouri and Arkansas who joined together in song to share our historic singing tradition with others. With everyone's help, it was indeed "a great day." - B.R. Fall and cooler temperatures are in the air. 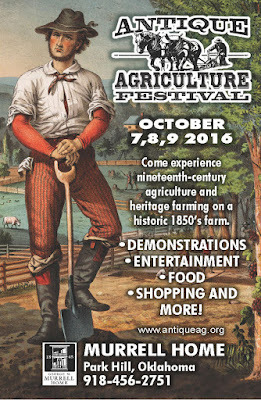 The Murrell Home staff have been hard at work on the arrangements for the Antique Agriculture Festival on October 7-9, 2016. We have a wonderful opportunity on Sunday, September 9th to share traditional Sacred Harp Singing with festival visitors from Oklahoma as well as Western Arkansas. Our thanks to the Murrell Home Historic Site Director, David Fowler and Amanda Pritchett, Historic Interpreter, for the invitation and opportunity for interested Sacred Harp singers to work together and learn together. First, please let your friends and other singers know via Facebook, bulletin board, conversation or email that the Sacred Harp singers who participate in the singing on Sunday, October 9th will be admitted free. Children are also a part of the Sacred Harp's tradition and one of our favorite singing instructors in Alabama was carried to her first singing in a large bread basket. We've all seen many children still in elementary school or middle school who are usually found next to parents singing, learning to sing or in some cases, even learning to lead. While singers will get in free - please tell the ticket takers that you're with the Sacred Harp singers - if you have other family members or friends who just plan to come to visit the festival and exhibits, they will need to pay. The regular admission charge for the festival: $5.00 for adults, children and teens 6-18 $3.00, 5 and under free. Parking is also free. Second, please pass along to your friends and singers that we've been requested to bring a lawn chair or folding chair of some description suitable for grass or leaves rather than a hard surface so that we can form the square where we will sit during the singing. The staff moved the location of the stage and benches for the public to "higher ground" on the upper side of the sidewalk in the park. They also trimmed low-hanging tree limbs from the area to form an area that will be in the shade much of the day, so we should be more comfortable than in the sunny area farther down the slope. While we're on the topic of bringing things, the Shiloh Singers will bring their "loaner books." Visitors are always welcomed at our singings and any of the visitors in the audience who wish to sit with us are welcome to tap their feet and even sing along. We'll also bring a folding card table so that neighboring Oklahoma City and Tulsa groups can display any literature or handouts with info about when they sing and where. I'll also maintain a clipboard for a sign-in sheet if anyone wishes to have more information or receive a newsletter and we'll make the sign-in sheets available to each group. We would also like to take a "group picture" during a break that would also be shared with Oklahoma City and Tulsa groups for newsletters or web sites. There is an area within festival grounds for food vendors and picnic tables are available should anyone wish to eat between the church service and the time we start singing. We'll also have a cooler with bottled water for the singers. You may want to pack a few snacks in your book bags in case the food vendors need to start packing after lunch. The Murrell House staff have planned a full schedule of events and things to see and do to make your visit as enjoyable as possible -- both as visitors and participants. The three-day event will include ongoing living history demonstrations, as well as entertainment, shopping and food vendors. The Murrell Home, built in 1845, is the last remaining 19th-century plantation in Oklahoma. Visitors are invited to watch demonstrations and participate in hands-on activities over a variety of topics including food preparation, domestic skills, trades, animal husbandry and farming. “All of the activities will be performed in the 19th-century manner,” said Fowler. Festival hours are 10:00 am-5:00 pm Friday and Saturday, and 10:00 am-3:00 pm on Sunday. We will have vendor/entertainer/volunteer parking in the lot of our park/picnic area, on the east side of the property. If you have anything to unload, please do that by 9:00am each morning. Thank you all for agreeing to participate! How was this wagon used? The George M. Murrell Home is a division of the Oklahoma Historical Society. For more information on the festival, visit http://www.antiqueag.org or contact the Murrell Home at 918-456-2751. First of all, the Shiloh Singers of NWA will be gathering for their monthly singing this Sunday afternoon, September 11, 2016 from 1:30 until 4:00 P.M. in the General Store on the grounds of the Shiloh Museum in Springdale. The forecast is for clear and sunny with a high of 80 degrees. It looks like a good late summer afternoon to drive over to Springdale and enjoy the mountains, the singing and the fellowship of spending an afternoon with friends. As usual, there will be a table at A-Q Chicken House for those who wish to arrive around noon and enjoy a wholesome chicken dinner and more time to catch up on the news among friends. Just ask for the Shiloh Singers when you arrive and they'll point you in the right direction. We had a wonderful singing in Springdale on August 8th with both Dan Brittain and Bill Caldwell to pitch and several new visitors and occasional singers. It felt like we sang more songs than usual just having a good time using the Denson book in the first half and the Missouri and Cooper books in the second session after the break. Photo: Syd shared this picture of Arkansas and Oklahoma singers at the 149th Annual East Texas Convention in Henderson on August 8, 2016. Please keep Mona Vice in your prayers. Mona is in rehab after falling and surgery to repair a previous knee replacement damaged in the fall. She may be in rehab for some time since the doctors don't want Mona to put any weight on the right leg for a while. If you're in the area, she's at Walnut Grove Rehab, 1393 Don Tyson Road, Springdale. We visited after Sunday singing and she seemed to enjoy the visit and working in therapy sessions morning and afternoon to regain mobility. I'm sure she would enjoy a card or a visit if you're in the area. Last month we discussed a marvelous opportunity for Arkansas, Oklahoma and Missouri singers to join together at the George M. Murrell Home Historic Site on Sunday, October 9th as part of their celebration of the site's agricultural and historical significance to Oklahoma and the Cherokee Nation. The official address for GPS drivers is 19479 East Murrell Home Road, Park Hill, OK 74451 which is just south of Tahlequah. Detailed directions are available on the Murrell Historic Site visitor's page. You can also learn more about the importance of the Murrell Home Historic Site in a multimedia presentation, "Seeds of History," the first online issue of Crossroads, produced by the Oklahoma Historical Society. The whole event planned at the historic site covers Friday, Saturday and Sunday, October 7-9. The Sunday schedule includes the usual planned displays, vendors, tours of the historic home and other activities but also starts with an outdoor church service at 10:00 A.M. and followed by a group singing of both Cherokee and English hymns at 11:00 A.M. After a short break for a quick lunch and time to arrange folding chairs into a hollow square, the Sacred Harp singers could then start after lunch and conduct an outdoor singing from about 12:00 P.M. We plan to bring our loaner books and invite spectators to sing along if they wished. We'll be singing in an open area in the trees east of the mansion. You may want to bring your hats and bonnets if the sun is bright. Photo: George M. Murrell Home Historic Site in Park Hill, OK, a Greek Revival-style plantation house Murrell called "Hunter's Home." Since the Shiloh Singers normally sing on the 2nd Sunday of each month except in March, we'll post a note on the door of the General Store, the website and hopefully in the local papers that we'll be singing at the Murrell Historic Site in October. The thinking is that we will have a small folding table where all three regional Sacred Harp singing groups can have information about their singings and provide a sign-up sheet where people can request more information or get on each group's local newsletter list. 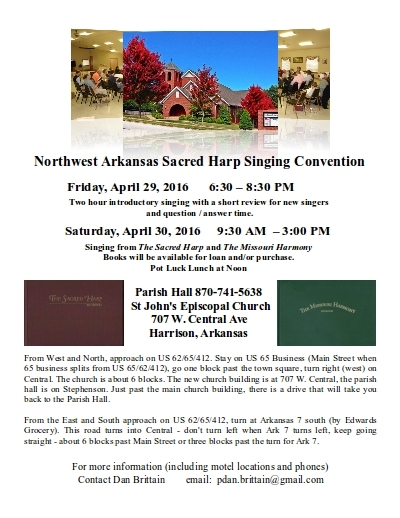 So part of our mission, beside just exposing Sacred Harp singing to a new audience, is to invite anyone in the audience to learn more and attend one of the local singings in their area. We also talked last month about the annual NW Arkansas Fall Singing and pot-luck lunch scheduled for Saturday, Oct. 22, 2016, 9:30 A.M. - 3:00 P.M. in the Northwest Technical Institute Student Center, 709 South Old Missouri Road, south of the rodeo grounds and across the road from the Springdale airport. As usual, I'll post a map on the webpage in October but it should be easy to find from all directions. The Student Center is adjacent to the parking on the SW corner of the campus. First of all, our thanks to Alexis Walker and NWTI for helping us find such a nice facility with plenty of parking. Everybody seemed to know more about the NWTI campus than I did and spoke positively about the using the student center for the Fall singing. I discovered that the Northwest Technical Institute is one of two career and technical education schools in Arkansas and has been in operation for nearly thirty-nine years. We'll be singing from the Denson book and Missouri Harmony. Please mark your calendar. The fact that we'll have a singing school on Friday evening, Oct. 21st, before the NWA Fall Singing may encourage people who want to take an opportunity to learn even more. So yes, this is also an opportunity for all three groups to reach out to potential singers in their area. October is shaping up to be a big month with plenty of opportunities to sing and share our Sacred Harp tradition. Hope to see you on Sunday and hope you can some of the special singing events in October! 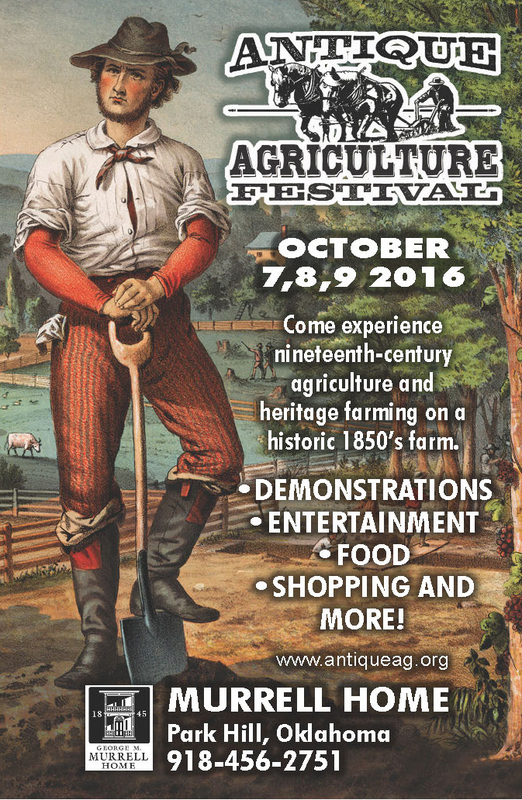 UPDATED 9/9/16 - Antique Agriculture Festival graphic added. The National Weather Service has predicted an almost cool 81 degrees for Sunday afternoon and we'll still bring an extra fan to keep all the Shiloh Singers, guests and visitors cool and comfortable at our August 10th singing from 1:30 to 4:00. I hope we have a good turnout. A couple of our regular song leaders are in route to Henderson, Texas for the 149th East Texas Convention so we'll need a good turn out to fill any gaps in the ranks. Photo: We had two special visitors at July's singing from Alaska! Campbell Longworth, from Fairbanks, and Nolan Lind, from Anchorage, stopped by for a visit and joined right into the singing. Alexis Walker was back leading from the tenor section. think everyone was very pleased with the turnout and we certainly hope anyone from Alaska to Florida, or any place between, will feel welcome to visit any of our events in the General Store at the Shiloh Museum or on the road. It's been a hectic few weeks down here on "The Rock Pile" in Mountainburg. Katy was tired from moving rocks again as she finished her landscaping improvements down by the road and my hand finally stopped shaking after writing the check to pay for some of the other improvements this spring and summer. I'm not sure if the new foot bridge, rock walkway and the finished structure looks more like a wishing well or a Shinto shrine. But it looks very nice and given a few seasons for plants to grow around it, will be a nice addition. Whether answered prayer or a good healthy wish, Gail Cowart is out of the hospital and rehab this week and he's gaining strength back with each passing day. He didn't think he would be up to making the trip to Springdale this Sunday but it won't take long if that former Army Ranger continues to follow his therapist's directions and work on his exercises. Please bookmark this webpage and check the Calendar section for events in September and October. There's a singing in Louisiana that may interest the singers in southern Arkansas on Sept. 3rd, there's the annual Columbia, MO, Singing on Saturday, Oct. 8rd, we'll need to post changes about moving our 2nd Sunday in October singing to the Murrell Home State Park in Park Hill, OK, on October 9th, and Alexis has found us a new venue for the October NWA Fall Singing in Springdale on Oct. 22nd. There's even more news, but I'm already past the deadline for getting the newsletter out. We'll post any further updates between now and the next newsletter on this webpage as they occur or as we've experienced this month, as soon as time permits. Don't forget the early Sunday arrivals in Springdale are invited to share a table at AQ's Chicken House just a few blocks from the Shiloh Museum starting around 12 noon. Desserts are optional after the singings at a local Denny's near the Interstate. Just follow the local singers or ask one of the regulars at the singing. On behalf of all the Shiloh Singers, we hope to see you on Sunday. This July update is a little earlier than usual to include the latest information about the Annual Shape Note Gathering at the Ozark Folk Center in Mountain View. Photo: Dan Brittain helps two young singers learn more about shape notes during the 2015 Shape Note Gathering. 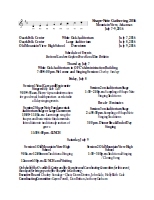 Click this link for Ozark Folk Center Shape Note Gathering Schedule - July 7-9, 2016. I've been traveling for the last couple of weeks, but I can add without hesitation that those who attended last year's gathering and singing learned about different forms of shape note singing and thoroughly enjoy the Saturday singing in the old Mountain View School auditorium. For those Shiloh Singers who cannot attend the Mountain View events, the Shiloh Singers will be at their usual General Store for the July Singing at the Shiloh Museum of Ozark History on Sunday, July 10, 2016 from 1:30 until 4:00 P.M. Visitors and children are always welcome. Likewise, the optional pre singing table at AQ's Chicken House in Springdale at 12:00 and post singing "Desserts at Denny's" will be observed so we can visit and enjoy the fellowship of friends. All in all, the 2nd weekend of July looks like it will be a busy one, but there will be plenty of good singing for everyone who can attend. Looking forward to seeing you at one or both of the events. The second half of May and the first part of June have been hectic with teachers and students both ready for the end of the school year. I've been retired for almost 20 years and I'm still ready for summer vacation each June. However, I hope you won't take a "summer vacation" from Sacred Harp singing. The Shiloh Singers will host its regular monthly singing on June 12, 2016 in the General Store at the Shiloh Museum. I may bring an extra fan to circulate the cool air a little better and we'll have the usual bottled water on the welcome table. The extra curricular activities - lunch at Springdale's AQ Chicken House and desserts at Denny's close to I-49 will both be optional activities if you can come early around noon or stay a little later. We never have enough time to visit with only a short break in the middle of our 1:30 to 4:00 P.M. singings. And somehow, singers always have plenty of news from family and friends to share. I hope you can make the trip and sing with us this month. Part of the good news is that Syd Caldwell isn't going to Disneyland this summer, Syd's going to Poland!! ...where he'll attend the singing school and make new friends in Europe. We sometimes think of Syd being the Shiloh Singer's goodwill ambassador to the several states on both sides of the Mississippi River but he'll have some stamps in his passport that not everyone gets to see. Syd, we're proud of you and know you're excited about the trip. Bon Voyage. We're running a little long on text and short on time, so I hope you get at idea or two from the audio and video files and that traditional shape note singing is available in Arkansas and surrounding states if you want to learn more. Hope to see you in the Country Store on Sunday.